When Paul and I got married, the first furniture we bought was for our bedroom. It was solid wood and well made. However, over the years, the finish wore away. When it began to look shabby, my husband decided to refinish it. I must say he did a great job. He restored it to look as good as new. That furniture reminds me that our God is also in the restoration business. In fact, he is the ultimate restorer. His creation is case in point. Adam and Eve lived in a perfect world without sin or death. That changed when they listened to Satan, doubted God, and rebelled. Ever since, the world and humanity have been flawed by the consequences. If you are like me, you have felt the tug of the sin nature many times this week. However, the Bible assures us one day God will restore creation to its original pre-sin, pre-death condition. 1 Cor.15:55-56 says, The sting of death is sin, and the power of sin is the law. But thanks be to God! He gives us victory through our Lord Jesus Christ. Thanks be, indeed. One day we will be sin free. 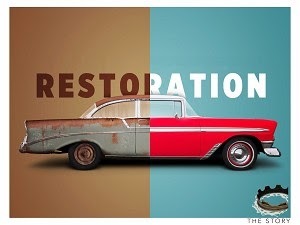 That is the ultimate restoration. Thank you, Father, for creating, redeeming, and restoring us.